Unfortunately, according to the International ID book they had at the casino, they only showed the Malaysian Driving Licence! I showed them my MyKad, but they wouldn't accept it because they said I could have copied and made it myself anywhere. And since the only thing they had in the book was the driving licence, they would not accept anything else! Which is quite dumb, because the MyKad comes with a chip, while the driving licence is so much like a piece of high-class paper that is laminated! Anyway, the security guard barred me from entering, and she called her superior, which was pretty crude. He came, said it wasn't in the book (MyKad), and said I wasn't allowed to enter, there would be no discussion, then just left. They demanded to see the even-bigger-superior who came about 10 minutes later. Aunt: "Three generations here, to see one singer!" He told them they only had seen the driving licence, and after a while, he asked to speak to me alone. He told me he understood that international students are cautioned against carrying their passport because of security issues. He also asked if I had other cards with me, and I produced my CreditCard which he swiped and which showed my name. Officer: "So, when were you born?" Officer: "So, will you be turning 22, or are you already 22?" Me: "I'll be 23 in January"
Officer: "That's enough for me. You don't have to carry your passport anywhere else, but if you go to another casino, bring it along, ok?" At the Casino: Grrrr...Big, ain't it? But, all's well, that ends well...Had a good time anyhow...They were just doing their job...Not that I looked underage! That was a lucky thing your aunts stood their ground, otherwise you would have missed out! There is no point to be so rigid with the rules especially whne an ID is produced and in your case you were accompanied by much older adults. IT goes to show how ignorant these north americans are. They think the drivers lisence is THE ONLY kind of identification that is existing and that all countries follow that. They diddin't consider that other countries have differnet forms of ID. Very happy you enjoyed the show. More stories Daphne! thts so weird. i never brought my passport anywhere and even before i got my local ID, i just used mykad and they accepted it. i think it all started w the first guy who said no to u and the others just dont wanna look like theyr 'questioning' his decision. im glad u get to go in w ur aunts and grandma. otherwise u could always give bad review abt tht casino/hotel. How was the concert? Looked like you already had fun in Canada! Aiyo, next time you go out some place where you need to show ID, make sure you wear some heavy make up that will make you look old, and wear some granny clothes! Heheh. Such a hassle, just to go watch Johnny Mathis sing! But good thing you aunts demanded to see the whoever was at the top of that chain of command!! aiyerr...even I get this "you look underage" look! heheheeheh!!! So blessed to have an extended family that is taking good care of you!!! Wow! 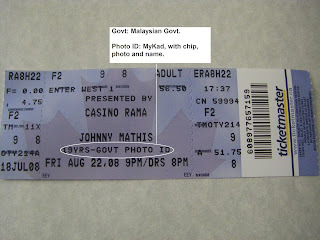 You pi tengok Johnny Mathis? You are a sentimental young girl. All the kerfuffle about your age? Ha ha...compliment lah tu. But, hey, look on the bright side, it does look like you are in a safe country, Canada. Their implementations of rules & regs are no nonsense eh? They do mean what they say! Respect. Sure takde Mat rempits there. err, johnny mathis who again? muahahaha...the only johnny i like is johnny knoxville. Good stuff in being able to see the show. But i understand at that moment, sure get the blood boiling..cause already bought tickets and stuff. Yes! Very, very lucky my aunts stood their ground. I'm already 3 years over the age-limit, pun kena tahan. My cousin, who's like 9 years over the age-limit, also, was checked. Now I believe you wen you say you look much younger than your age. Love Johny Mathis too. Is it another coincidence? Hehe...Yeah lar, compliment lar, but at that point in time. The concert was cool! It is just so different watching something live and hearing it without any modifications. So yeah, am enjoying myself here! Haha. If I get all dressed up with heavy make-up and granny clothes, after they think I'm playing dressed up, then how? But yeap, I've got aunties who won't let you step on their heads. They know their rights! If even you get mistaken as being underage, with your 3 cute boys in tow, then me how ar? As for the rules and regulations here, yeah lor. Very strict. Mat Rempit memang takda. In fact, there aren't many motorbikes around. Very, very few. Paid money and went all the way, you know! Aaar.. kan you still budak kecik? Daph, how are you ober there now? Judging from the pics you are are having fun. Hows the internet connection there? Super fast? I have a friend whose daughter is interested in getting a scholarship in Canada. Could you contact me at my email regarding this? Please!